Chef Meny Vaknin’s Jewish Moroccan upbringing makes dining at MishMish a pleasing experience for the stomach and the soul. 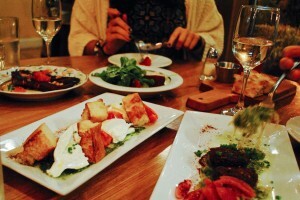 MishMish brings Mediterranean cuisine to Montclair. Tucked cozily into a side street of Montclair Center’s growing dining scene is MishMish, a Mediterranean restaurant offering gourmet meals served in a congenial environment. Working his way up from the line to head of the kitchen – by way of the French Culinary Institute – Vaknin earned a spot on the opening team of Boulud Sud and eventually served as executive chef in Pera Soho and Grata. After moving his family to New Jersey, Vaknin ran the kitchen at Eastwick in Brooklyn, but knew that his own place was a project he really wanted to commit to, and Montclair the town in which to do so. Montclair couldn’t be more lucky to have him. 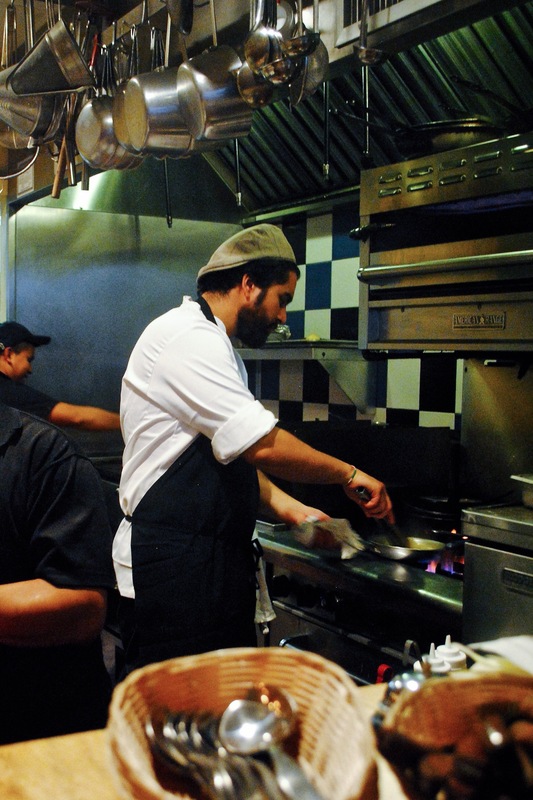 Vaknin cooks the same way his mother and grandmothers did: with deep respect for food. Dinner at MishMish starts strong with dips: the silky dairy-based, the za’atar-dusted and tahini-kissed dips. I’d heard rave reviews about MishMish’s hummus ($7) and was certainly not mislead. Extremely fresh and topped with olive oil, paprika and whole chickpeas, bites of hummus are pleasing to the eye and palate. But other options are out to steal the show. The smoked eggplant dip ($7) and beets with labne ($7) to the left and right of the hummus plate did their job well. With eggplant whipped lighter than air, MishMish’s take on baba ghanoush doesn’t even need the pita that comes served on the side of each order. A forkful of the dip is a fully realized experience: smoky and delightfully seasoned, with tangy crumbles of feta. It comes as no surprise that this recipe made Time Out New York’s “100 Best Dishes of 2013” list when Vaknin served it at Eastwick. The house-made pita at MishMish is served hot, blistered with black charcoal tattoos; a testament to how recently it’s been plucked from coals. More reminiscent of the naan one would find in West Asian cuisine than of its Greek counterpart, the pita at MishMish should not be cast aside. Leave the monochrome beiges of store-bought pita in the plastic bags in your freezer where they belong. 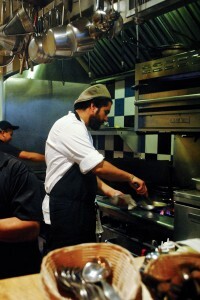 Vaknin places as much care on the ingredients themselves as he does when transforming them in the kitchen. Reliant on a local Harvest Drop, Vaknin is especially excited about adding new Fall produce to the menu. This week’s specials were crisp and bright, highlighting flavors of the changing seasons with an Autumn salad ($11) and falafel plate ($8). As sad as I am to see the last of the year’s peaches, Vaknin made the transition from summer incredibly pleasant, serving them atop a bed of Red Russian kale so tender it makes me wonder why the leafy green doesn’t appear in every salad. The falafel is handmade and not too garlicky nor heavy with oil slick. But the local spaghetti squash mixed with housemade basil pesto served underneath the falafel is where Vaknin’s culinary prowess shines. The sauce is smooth, adding an unexpectedly refined flavor profile to the falafel, as basil is not often featured with this type of dish. Burrata cheese ($11) and focaccia join with cubed heirloom tomatoes, basil pesto and a touch of Sumac for a Mediterranean spin on caprese salad. The charred Spanish octopus ($14) is both crispy and tender in different areas of the tentacle. The salty meat is offset with the silky, aromatic fennel purée upon which it rests. Bursts of citrus and crunch accompany each bite with the addition of grapefruit and slivered Marcona almonds. Shakshuka, ($9-14) a North African Israeli dish of eggs poached in spicy tomato sauce, is well seasoned and hearty. Perfectly runny egg yolks blend with the sauce and snowy feta crumbles, turning the dish as orange as MishMish’s walls. The option to add lamb meatballs or shrimp may be necessary for the carnivore, but these additions are not going to make or break the dish. If you’re smart enough to leave room for dessert, Vaknin’s Saffron crème brûlée ($9) should not be missed. Tapping through the layer of caramelized sugar for a bite every bit as creamy as the aforementioned dips, (Vaknin knows how to purée!) the custard is not too sweet, a refreshing deviation from the all-too-sugary desserts of many restaurants. Topped with macerated strawberries, the dish is a lovely way to finish a meal at MishMish. Though if heavy dessert is desired, the syrup-soaked, sweetened goat cheese-stuffed fillo pastry ($9) is a great choice; I ordered one to go. Hours: Dinner: Tuesdays through Thursdays, 5 to 9 p.m.; Fridays and Saturdays, 5 to 10 p.m.; Sundays, 5 to 8 p.m. Lunch: Tuesdays through Thursdays, 11:30 a.m. to 5 p.m.; Fridays and Saturdays, 11 a.m. to 3 p.m. Brunch: Sundays, 10 a.m. to 3 p.m. Closed Mondays. Reservations: Accepted and highly recommended. Wheelchair access: Café is on one level. The restroom is located down a corridor outside the dining room. Bonus Tip: Dine with people who like to share and split everything. Don’t skip the dips. MishMish is located at 215 Glenridge Avenue in Montclair, N.J. and can be reached by phone at 973-337-5648. Visit their website at mishmishcafe.com for more information.